"Kanaka, Nelson, and Souther Creeks, Skamania County, Washington"
Kanaka Creek, Nelson Creek, and Souther Creek are located in Skamania County, Washington, and lie just upstream of the Washington community of Stevenson. Kanaka Creek lies at Columbia River Mile (RM) 151, Nelson Creek at RM 151.5, and Souther Creek at RM 152.5. One mile further upstream is Carson Creek (RM 153.5) and two miles further upstream is the Wind River (RM 154.5). One mile downstream of this trio of Creeks lie Rock Creek (RM 150) and Rock Cove (RM 149.5 to RM 150). On October 30, 1805, Lewis and Clark spotted "... a large creek on the Stard. Side in the mouth of which is an Island, ...". Today historians say this was Rock Creek. However in 1905 (and earlier ???) it was thought to be nearby Nelson Creek. "... Two and one half miles below Wind river the Lewis and Clark party came to a creek on the right, with an island in its mouth. This is now called Nelson creek, but the shifting sands have covered the rocky island spoken of at its mouth, closed up one of the channels, and is unrecognisable from the account given by the exploring party. ..."
Nelson Creek lies just under three miles downstream of the Wind River while Rock Creek lies approximately 4.5 miles downstream of Wind River. Captain Clark's first draft of October 30, 1805 places their "large Creek ... with an Island in the mouth" at 4 miles downstream of Wind River. S.30oW. 4 miles to a Island, at the Commencement of the grand Shute and the Stard. Side where we Campd [Ashes Lake]. passed maney large rocks in the river in th, a large Creek on the Std. Side at 2 miles, with an Island in the mouth. passed 3 Islands on the Stard. one on the Lard above 2 Small Islands opsd. to us on which there growes 6 large Pine, 4 rock Islands which almost Chokes up the river -- a deep bay to th Stard. on which the Indians live in 8 large worm Houses 2 ponds back of this on the Stard 1 above the Islands, one on the Lard. side. Several Small rocks -- in idft. pts." 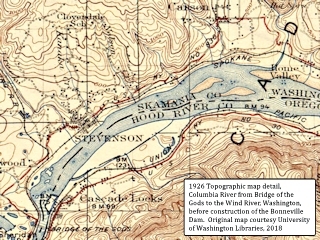 Click image to enlarge 1926, Topographic map detail, Columbia River from Bridge of the Gods to Carson, Washington. Original "Hood River 1:125,000 Quadrangle" map courtesy University of Washington Libraries, 2018. Before construction of the Bonneville Dam, showing Bridge of the Gods and Cascade Locks, Oregon, and Rock Creek, Stevenson, Kanaka Creek, Nelson Creek, Souther Creek (not labeled), an un-named creek, Carson Creek (not labeled), Carson, Home Valley, and the Wind River (not labeled), Washington. 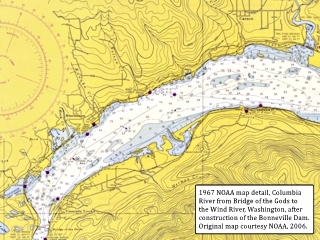 Click image to enlarge 1967, NOAA map detail, Columbia River from Bridge of the Gods to Carson, Washington. Original map courtesy NOAA, 2006. 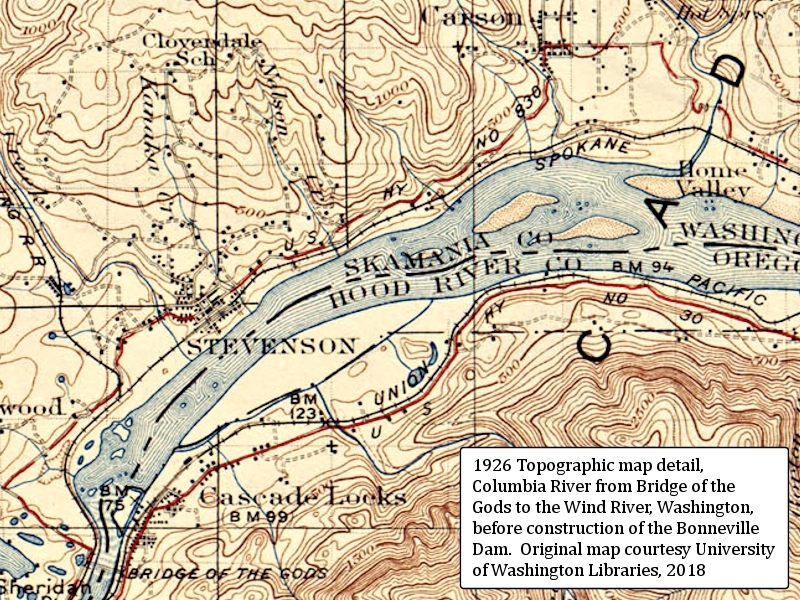 After construction of the Bonneville Dam, showing Bridge of the Gods and Cascade Locks, Oregon, and Rock Cove, Rock Creek, Stevenson, Kanaka Creek, Nelson Creek, Souther Creek (no labeled), and un-named creek, Carson Creek (partly labeled), Carson, and the Wind River, Washington. Kanaka Creek lies at Columbia River Mile (RM) 151. Nelson Creek lies at Columbia River Mile (RM) 151.5. 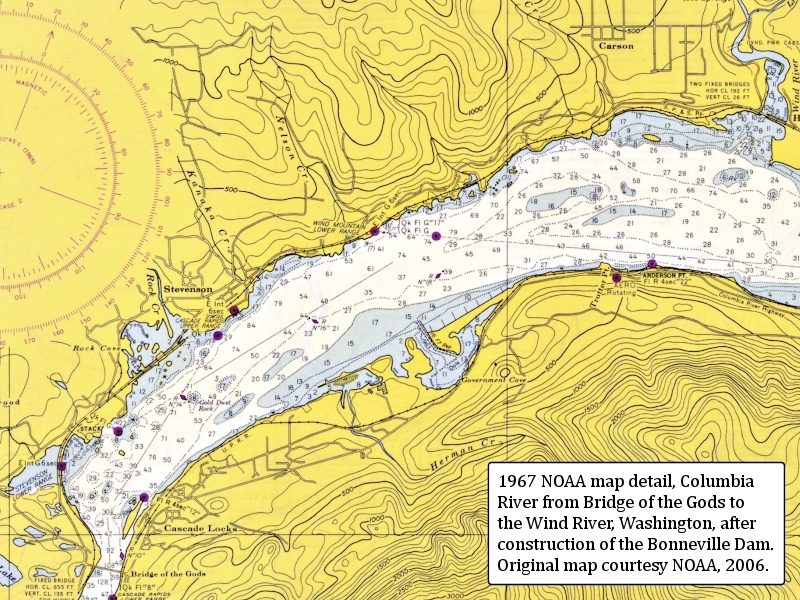 Souther Creek lies at Columbia River Mile (RM) 152.5, with its mouth located in T3N R8E, Section 31. The U.S. Bureau of Land Management's 1878 cadastral survey map for T3N R8E has Souther Creek labeled "Smith's Cr.". Kanaka, Nelson, and Souther Creeks, etc. Nelson Creek, Skamania County, Wash.
"A most fitting place for trade business in Cord Wood, etc. Por particulars apply to the postmaster Nelson post office, Washington." Source: "The Dalles Times-Mountaineer", August 6, 1892, courtesy Historic Oregon Newspapers Archives, University of Oregon Libraries, 2015. "Skamania Pioneer: The new scow Thompson, is now taking on her first load of wood at the Nelson creek flume. She is a well built scow equipped with all the latest improvements, and is a credit to her builders. We understand that Capt. G.W. Thompson, well known on the river ever since scows have been run here, will have charge of her." Source: "The Dalles Weekly Chronicle", November 20, 1895, courtesy Historic Oregon Newspapers Archives, University of Oregon Libraries, 2015. "... Within the borders of this county are primeval forests of cedar, pine, hemlock, spruce and yellow and red fir, unmarred by the ax or saw. Only a few mills are in operation, the Oregon Lumber Company leading, from whose five miles of flume a continual stream of lumber pours into the Columbia River. The Storey & Keeler Lumber company will take the principal part of their logs from the Wind River Valley, having just completed in Wind River vast improvements at an outlay of thousands of dollars. This mill will have a capacity of 60,000 feet. Near Stevenson the Nelson Creek Company is in operation with a daily output of 25,000 feet. ..."
Source: "Mourning Oregonian", January 1, 1902, courtesy Historic Oregon Newspapers Archives, University of Oregon Libraries, 2015. "STEVENSON, Wash., Nov.27.-- Sam Samson, proprietor of the Hot Springs Hotel, is busy supervising the work of diverting the water of a small creek which has been menacing Second street into Kanaka Creek. A deep ditch is being dug along Vancouver road, into which 315 feet of 24-inch culvert is being laid." Source: "Sunday Oregonian", November 28, 1915, courtesy Historic Oregon Newspapers Archives, University of Oregon Libraries, 2018. S 30° W 4 miles to a Island, at the Commencement of the grand Shute and the Stard. Side where we Campd. passed maney large rocks in the river ... a large Creek on the Std. Side at 2 miles, with an Island in the mouth. passed 3 Islands on the Stard. one on the Lard above 2 Small Islands opsd. to us on which there growes 6 large Pine, 4 rock Islands which almost Chokes up the river -- a deep bay to th Stard. on which the Indians live in 8 large worm Houses 2 ponds back of this on the Stard 1 above Islands, one on the Lard. side. Several Small rocks -- indift. pts.